Thinking of maybe starting to RP in WoH, but i have no idea whats going on in there... Can some one give me the short version? Also it looks like its a combination of mavel and DC heroes and organizations as well as custom characters? is that right? Are there rules to making a hero, besides not taking one that's already "claimed"? Basically, its a mix of Marvel, DC, Image, and perhaps some very off shoot characters from the books. But they all live in the same world. Basically there was a alien invasion (The Chrell) that happened 18 years ago and all the original heroes were killed. New Heroes, and villians, are now making themselves known and taking the place of the ones that died...some have taken the original monickers, while others are like the originals, but have different names. Example, I have Superman. Not Clark Kent, but Christopher Chase. Not Kal-El, but Ree-Van. Creating a 'original' character, you just can't base the characters power set off an existing comic book character that has been claimed by a member. There are actually 'alot' of good characters out there that haven't been claimed yet. I don't know how well you know comic book heroes and villians, but there are many out there. Was there any particular comic character that you liked, or would like to have a shot at? This is a good place with a short rundown on things, and answers your questions about creating a character. Nich is correct. That is a good run down of everything. Any other questions, feel free to ask. Superman has an immediate hate for whatever character you choose.....just sayin'. *smirk* No one disses on the Boo. oh my god, go for Bizarro. Mirrodin2nd wrote: oh my god, go for Bizarro. Found that pic like 5 mins after posting i was thinking about He-man... so i shared it lol. I didn't say anything about not wanting He-Man. I said Bizarro because I know what annoys Nich about Superman. Boo as in significant other. WoH Superman has a thing for WoH Wonder Woman. Doesn't....Doesn't Wonder Woman get a say in this? PIFFFT...!!! Powergirl you silly... That is powergirl right? Mirrodin2nd wrote: .......Nooooo.....She's a woman. You may send me his cookies now Peay. I'll fight you, Old Man. hmmm should i name him out right he-man... the wanderer or just Prince Adam? Kinda leaning to Adam, in a way that he gave up his secrete identity due to a number of dark happenings that render it useless... Wondering if i should make it that he was banished to earth as a way to be rid of him from eternia so skellitor can have his way and now he must find a way back, or if he came to earth with the cosmic key looking for something? Going to have teela wit him, still deciding if he remains in his he-man form constantly, be it he grew into it and the sword of power now merely augments him in some way or because if he were to transform back he wouldn't be able to transform into he-man again... hmmm so much to think about... its fun. 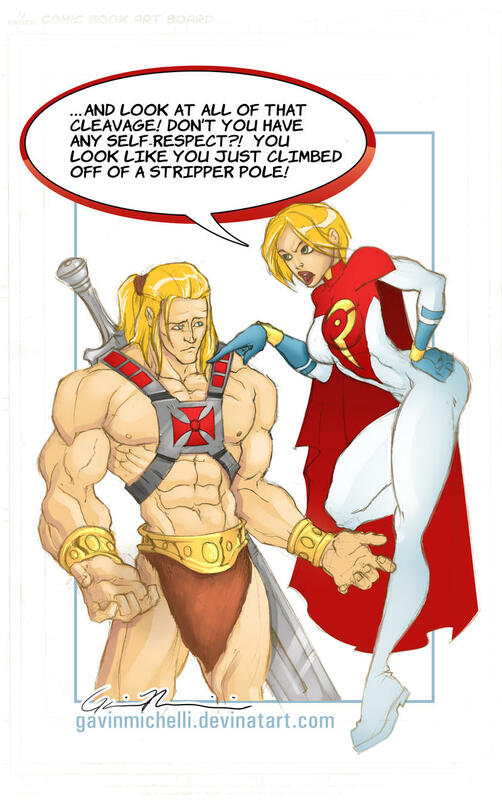 So thinking of trying this again, Does He-man fall under uber character? I kinda feel he does. If so I'm seeking permission to make him. Eh, he's strong, but he's not like zomg strong and what not. I did some reading up on the subject. Anyway, I don't think it's anything too out there. Make friends, be merry. Someone stop Pops from eating all the M&Ms.